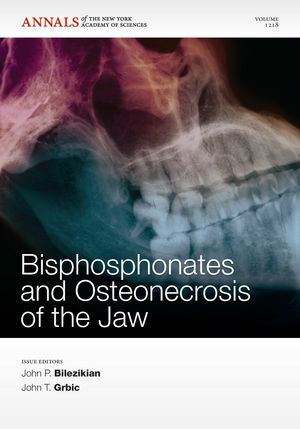 In the last several years, reports of patients treated with bisphosphonates (primarily those delivered intravenously) have emerged associating their use with osteonecrosis of the jaw (ONJ). More than a thousand cases of bisphosphonate-associated ONJ have been identified since the first cases were reported in 2001. In these, ONJ rarely occurs "spontaneously"; the vast majority have been associated as a consequence to oral surgical procedures. Although most of the reports of ONJ have occurred in patients following the use of high dose IV therapy for metastatic bone disease, there are also reports of ONJ in patients taking oral bisphosphonates. Since millions of patients take oral bisphosphonates for the treatment of osteoporosis, it is timely to review what is known and needs to be learned about this emerging issue in patient care—to develop a consensus on the definition of ONJ, as well as to explore potential risk factors and pathogenic mechanisms of ONJ and to explore strategies to move research forward. This volumes seeks to improve awareness of the condition and the need for increased screening and improved diagnosis of ONJ. It also explores possible treatment options for ONJ to help guide future areas for research. NOTE: Annals volumes are available for sale as individual books or as a journal. For information on institutional journal subscriptions, please visit http://onlinelibrary.wiley.com/journal/10.1111/(ISSN)1749-6632. John P. Bilezikian is the Dorothy L. and Daniel H. Silberberg Professor of Medicine and Professor of Pharmacology at the College of Physicians & Surgeons, Columbia University. He is Chief Emeritus of the Division of Endocrinology and Vice-chair of the Department of Medicine for International Research and Education. He is also Director Emeritus of the Metabolic Bone Diseases Program at Columbia University Medical Center. Dr. Grbic is Professor of Dental Medicine at the Columbia University Medical Center and the Director of the Division of Foundational Sciences at the Columbia University College of Dental Medicine. He was Director of the Center for Clinical Research in Dentistry from 1998-2012. Dr. John T. Grbic received his Doctor of Dental Medicine degree from Fairleigh Dickinson University School of Dentistry, and a Master of Medical Science degree from Harvard University. He also received his certificate of specialty training in Periodontology from the Harvard School of Dental Medicine, and was a Research Fellow in Surgery in the Laboratory of Surgical Immunology at the Brigham and Women's Hospital/Harvard Medical School. Dr. Grbic is an attending at New York Presbyterian Hospital. Dr. Grbic has been an investigator on research projects funded by industry and the National Institutes of Health, and has published over 60 papers or book chapters.